Oh well, catcheswere still fairly consistent with the evergreen Ah Chong and my family had a ball of a time bringing up fishes. 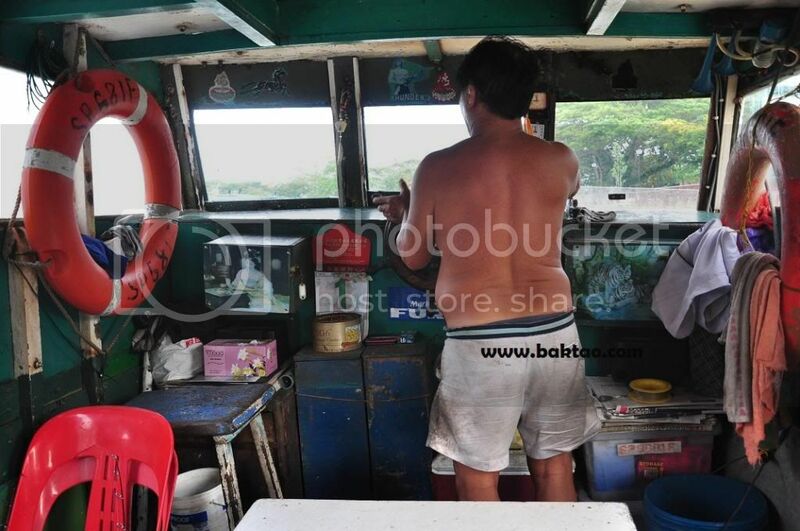 We were fishing the spring tide and Ah Chong brought us to a number of shallow hide outs between 2 meters to 5 meters near the current Pulau Tekong reclamaton works... yes... they are going to reclaim that as well. It seems that next time Changi will just be a single fairway with a bridge in the middle. 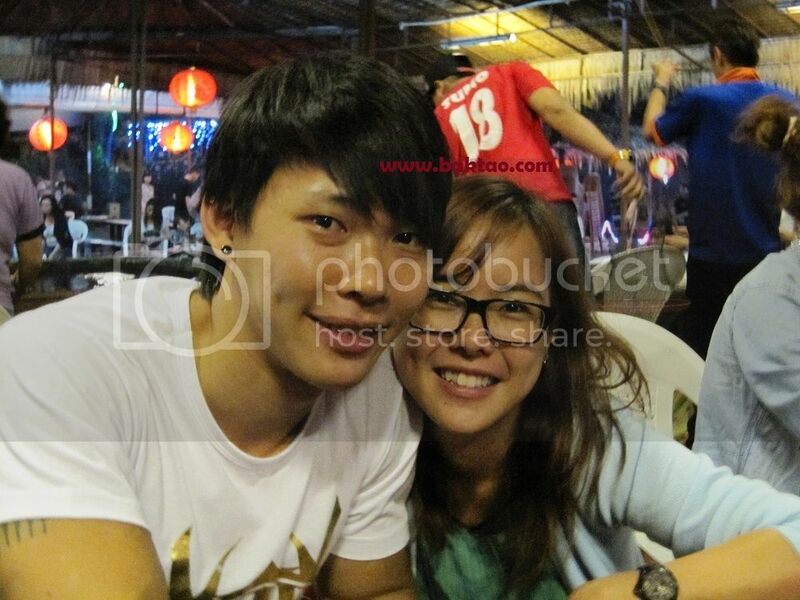 Evergreen Ah Chong with his lucky smelly white shorts! Live prawns the bait of the day again! 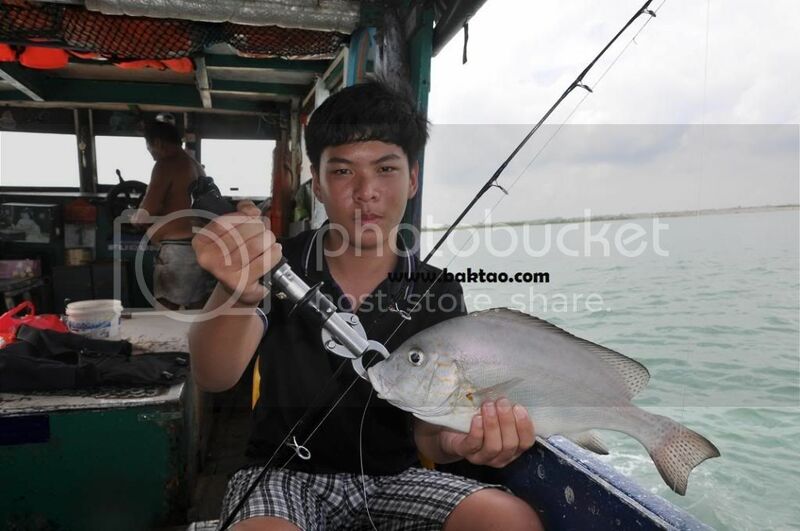 Weiyee doing Extreme Fishing! A great Robson Green fan he is! My brother as always.... having his fair share of fish and bringing up each fish nonchalantly! I personally enjoyed myself when I got myself a 2lb red snapper on 4-8lbs tackle and 6lbs frog hair FC line! The highlight of the day came when one of the kakis had the line busted by a suspected huge barramundi as the fish went under the boat and messed up a few lines before taking off like a steam train! What a pity! 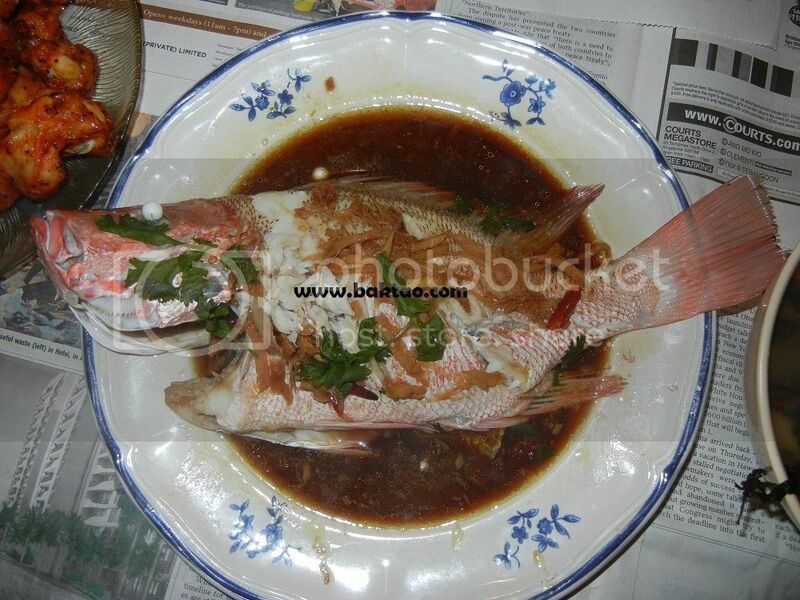 We returned home that day to have a great meal of Steamed Ang Kuey aka Red Snapper! I'll be updating a Sibu Kelong trip to Ah Ngan (Wing Sing Kelong) Kelong and fishing with boatman shawn on my next few posts! 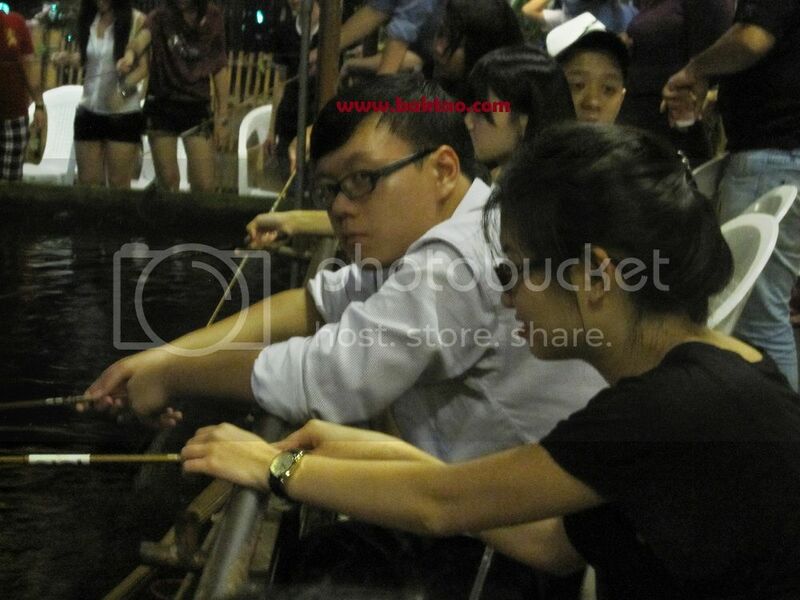 Prawning At Haibin Bishan on Christmas! 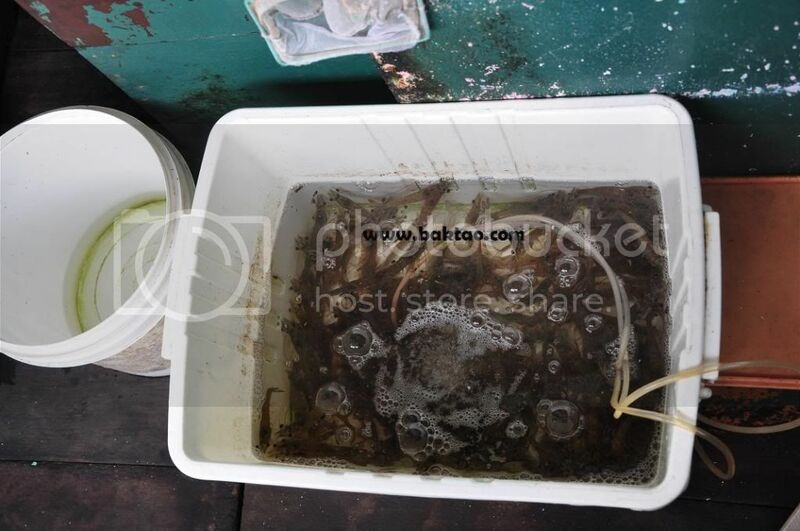 Over the festive Christmas and New Year period, I introduced some friends to prawn fishing over at Haibin Bishan (Address Details can be found on the link). 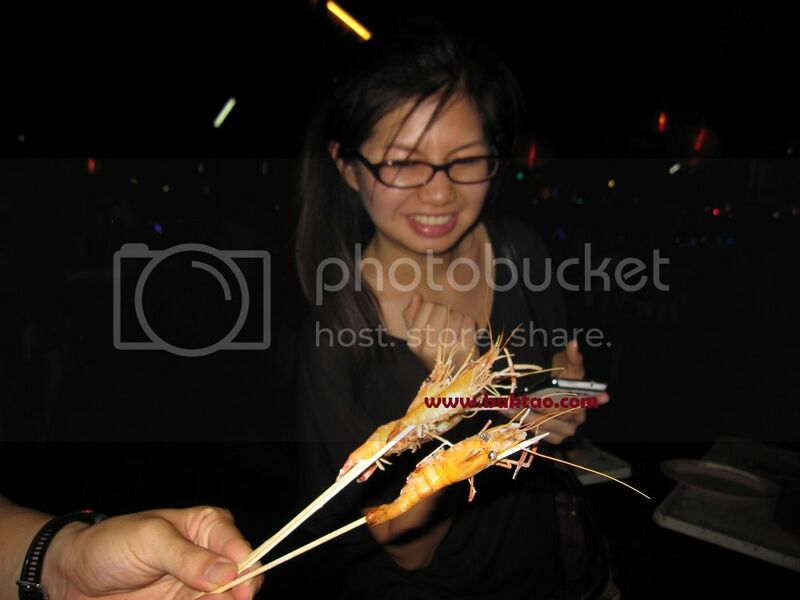 Haibin Bishan is one the better places to try your luck at prawn fishing because of the crowd and longetivity of this prawn fishing joint. The fact that so many people do their prawning there means that the management will always release prawns so it's up to the individual to be skillfull enough to catch the prawns! I've heard lots of complaints about people not catching prawns there but I firmly believe one should first learn the basics and tips of prawning before complaining! After parking our cars (it's free parking at Haibin Bishan btw), we made our way to the prawning area and some of my friends were suprised at how clean and "hip" the place was. There was a beer garden, zhi char seafood stall and even the fish spa thing. Frankly speaking, till this day I couldn't determine what's the difference between the bottom four ponds at the lower level of Haibin Bishan compared to the two ponds near the entrance. We made our way to the bottom four ponds on the hunch that it is better to rotate between four ponds than two! 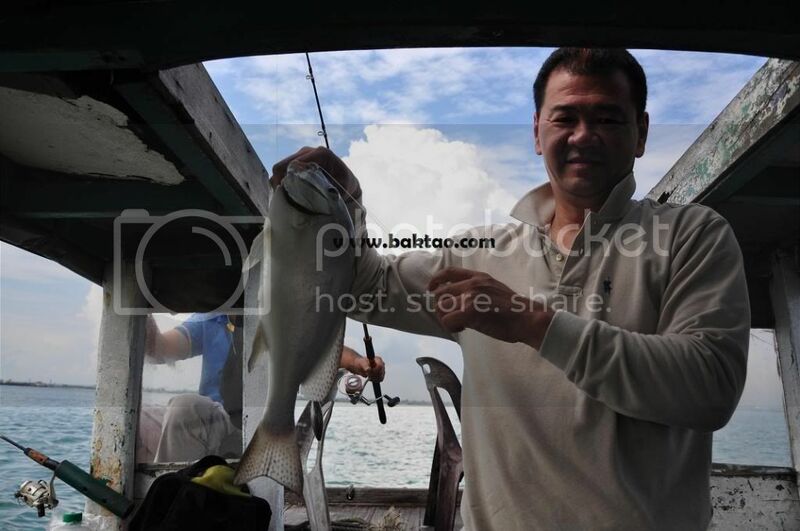 My friends were all newbies to prawning so some of us shared rods while some of us took our own rods for 3 hrs. Prawning rates are at the usuall rate of 3 hours $33. It took awhile to get us started but we started getting out prawns as time went by. I slowly went through some prawning tips and basics to my friends while trying to catch prawns for the group for the BBQ later! 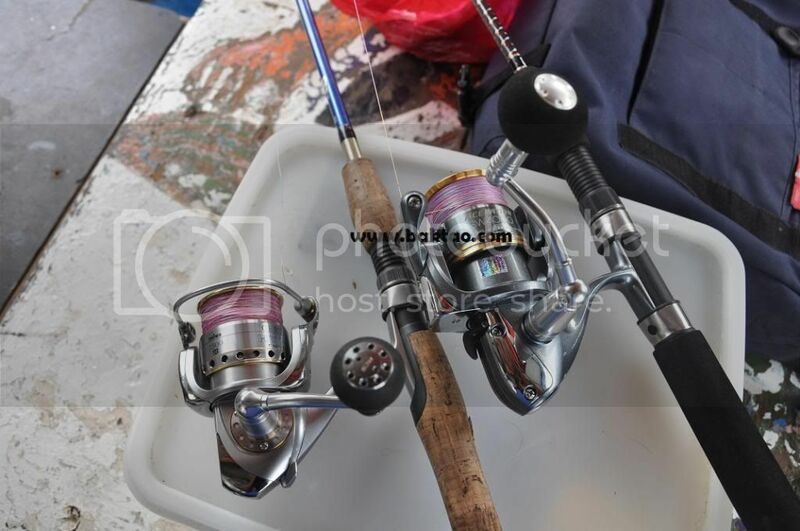 Newbies to prawning should either wait longer and use the "lifting" method which is basically just lifting the rod or they can use the "striking" method which most people do it wrongly. They either strike too forcefully or think that they striked but what they did was a lift. To strike successfully, a quick flick of the wrist is all that is needed! Joel trying his hand at prawning! Prawning is great for couples and where guys can pick up girls as well! 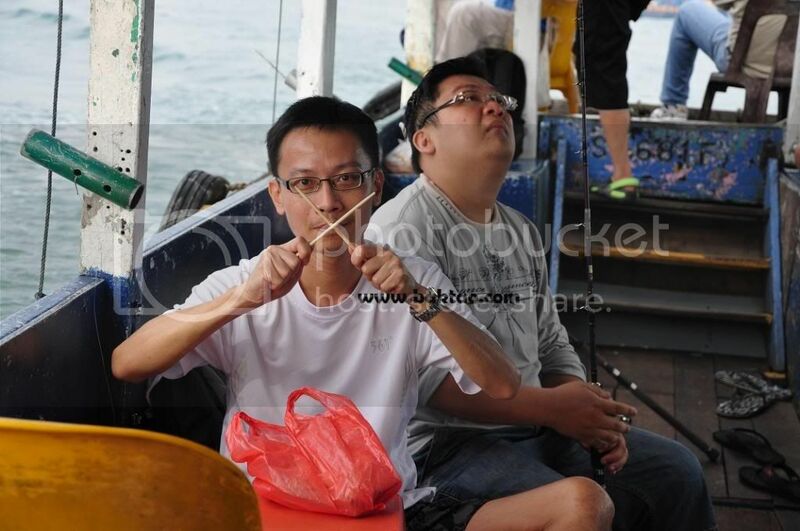 A good tip will be for guys to act all macho and help the girl remove the prawn from the hook! Another tip of prawning is the timing of prawn feeding/releasing times. 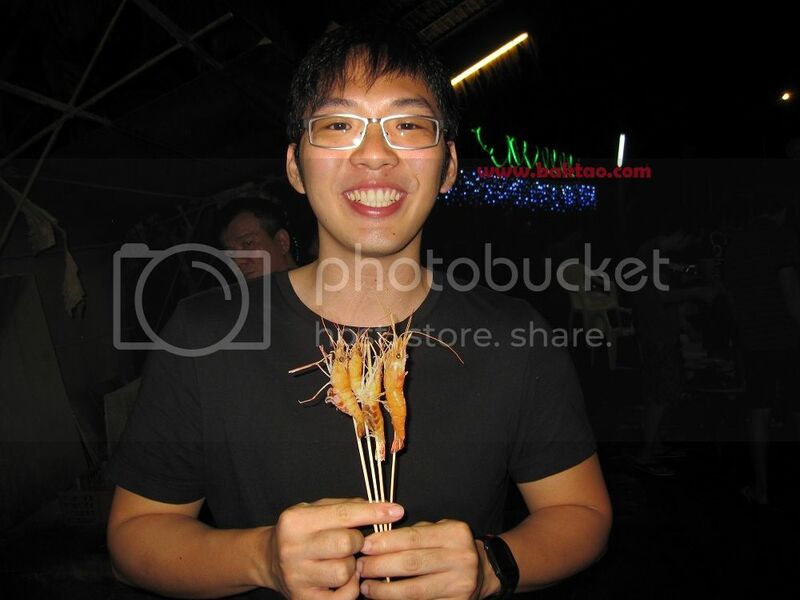 Often, prawning kakis would be very excited when fresh batches of prawns are released into the pond. This according to my observation is a misleading reaction. Prawns usually feed only after some time they are being released - for the first 30 minutes or so, prawns need to get used to their surroundings and very often you will see them swimming on the surface etc. 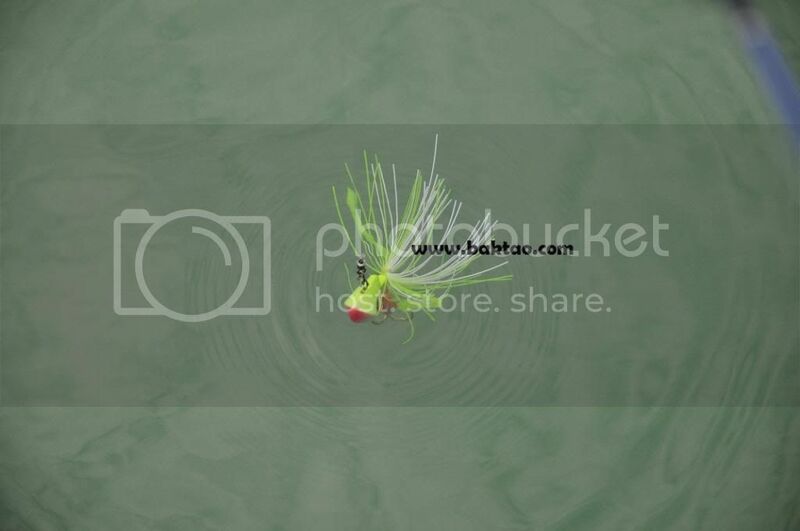 The so called float movements are usually from the prawns when they brush against the line! In conclusion, true experience really counts in judging if the prawns will feed and you can plan your timing such that your timing covers more feeding times - etc you can "keep your timing" and go for a meal when the prawning is sluggish and come back later at a fresh feeding interval! 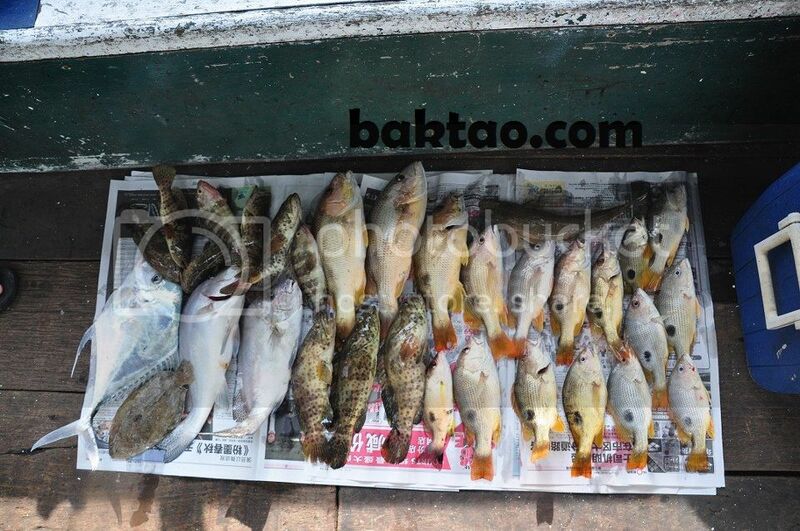 And the best thing is that if you apply this to Haibin, you have four ponds and if you are good at it, you only prawn at the ponds in which the prawns are feeding! All these may take some time to absorb and some prawning time before you get the trick but it is a very important theory in prawning! Anyway back to prawning... I guess we didn't really do that well. We took a total of 3 rods and only managed to land about 40 - 50 prawns? The prawns are really very small these days so it is a rather measly catch! But the prawns were enough to let my friends have their first taste of fresh BBQ freshwater prawns/yabby/blue mountain prawns for the first time! Jayne with a bimbo prawn look! 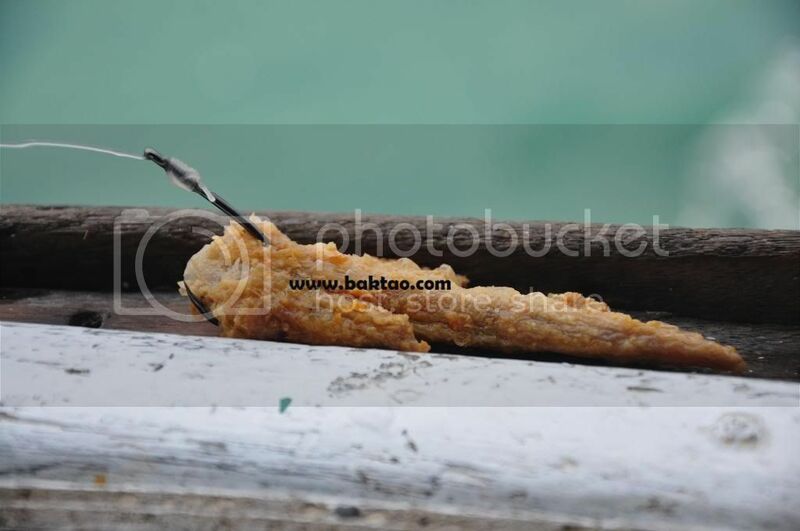 And that ends a rather more tips based prawning post than an actual outing but I hope these prawning tips will prove useful for our prawning fanatics and those folks that Email me questions on how to do prawning and the best baits for prawning! Changi Village Hawker Centre Reopens! Hey all Singapore fishing kakis, just want to let you all know that the famous Changi Village Hawker centre is reopened after months of renovation! Fishing kakis will no longer have to go out of their way to get a good breakfast or lunch after fishing! The Changi Village Nasi Lemak from the malay stalls, fried carrot cake stall, wanton mee stall there open early in the morning so you can get your good singapore breakfast or take away lunch for your offshore fishing trip be it fishing at Chia Soon Kelong at Pengarang or fishing at Pulau Ubin! If you're there in the evenings, I suggest the hawker centre chinese mutton soup, wanton mee or seafood stall. 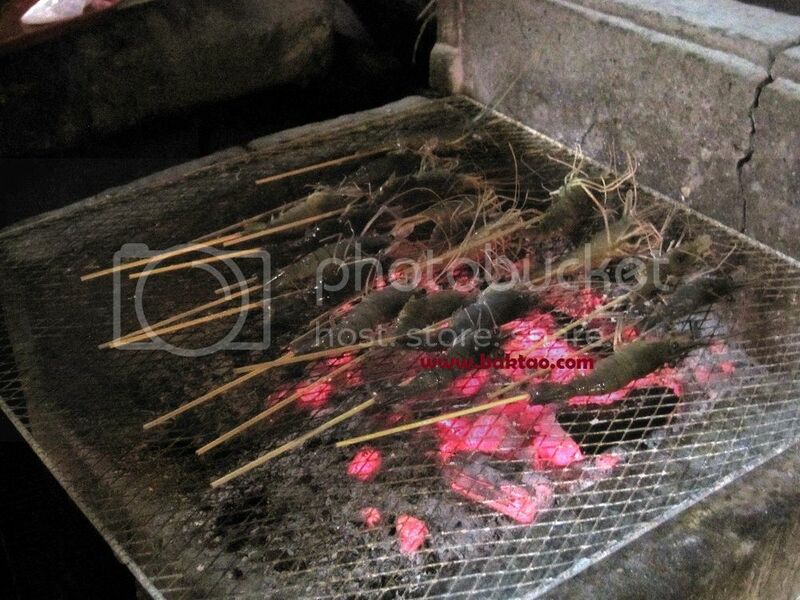 You can bring your fresh catch to the seafood stall to BBQ! 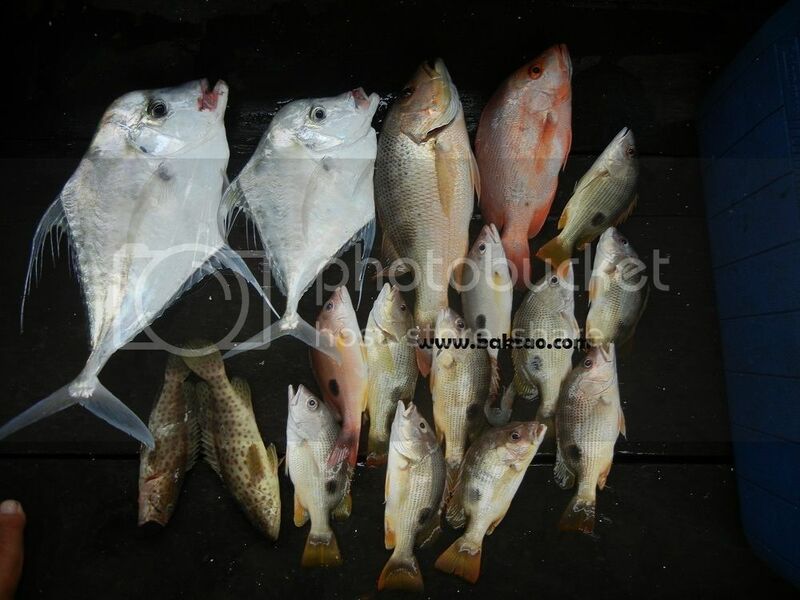 Btw, will be posting up some Changi CRs in the next few posts.... once you get the recipe for Changi offshores right, there seldom is a bad catch! Who says good fishing isn't possible in December!